If you are an athlete or even a weekend warrior, you might have suffered a pulled hamstring. It’s a painful injury that requires patience to recover from. A more severe injury could require a medical professional. The word “hamstring” comes from the Old English word hamm, meaning “thigh.” It’s a group of three muscles located from behind to knee to just under the buttocks. These muscles help flex the knee and extend the hip. The three muscles in the hamstring trio are the semitendinosis, the semimembranosis and the biceps femoris, which has two attachments. Sometimes a portion of the adductor magnus muscle is included because it attaches to both the pelvis and the thigh bone. The hamstring is involved in activities like running, jumping and climbing. It is less involved in walking or activities that don’t include much bending of the knee. Many people make it through life without straining their hamstrings. Tight hamstrings are common because of poor posture and/or a sedentary lifestyle. Doing more lifting, squatting and bending helps strengthen the muscles and keep them in correct alignment. Tight hamstrings can also be the result of tucked pelvis and misaligned quadriceps. Athletes in sports like soccer, football, tennis, and track are most likely to hurt their hamstring. Even jumping rope and using an elliptical can lead to issues with this muscle group. Tears or strains usually occur at the midpoint of the thigh. There may be a “popping” sensation, limping and an inability to continue an activity. The most commonly injured muscle in the hamstring is the biceps femoris. Semitendinosis damage is less common, and injuries to the semimembranosis are rare. Hamstring re-injury is a concern if there has been previous damage. Hamstring injuries usually occur with sudden movements like sprinting, jumping or lunging. Often, hamstring injuries don’t require medical imagery to be diagnosed. If a tear or a more serious injury is suspected, the most likely tests ordered would be an ultrasound or an MRI. 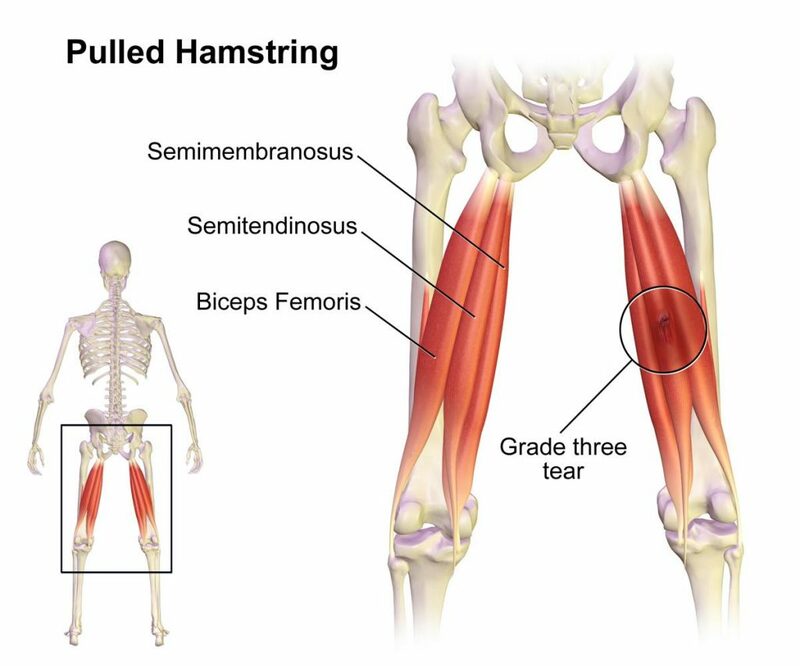 Hamstring injuries are classed in one of three categories. Grade 1 is a mild strain or pull that, with rest, ought to heal in a matter of days. Muscle strength is not affected, but there may be focal tenderness that is aggravated by stretching the damaged thigh. Grade 2 is a partial muscle tear, and Grade 3 is a ‘rupture’ or complete muscle tear. There may be tenderness, swelling and visible bruising. A tear may present as a physical depression in the muscle. Grade 2 and Grade 3 injuries can take weeks or months to heal. Like other muscle injuries, initial treatment for a hamstring strain or tear should follow the RICE protocol. First, Rest the leg, keeping it as still as possible. Crutches might be required for Grade 2 and 3 injuries. Next, Ice the leg with cold packs every 15-20 minutes every 2-3 hours. For Compression, use elastic or a tubular bandage to help blood flow and provide stability. Last is Elevation. Keep the injured area elevated above the heart to reduce swelling. It is crucial not to return to exercise too quickly and risking re-injury. But there’s also a danger in keeping the muscle immobile for too long. This could create scar tissue and cause the muscle to shrink. If there is severe damage, splinting may be necessary. A short course of anti-inflammatory medications may be called for. Chiropractic treatment has a lot to offer in rehabilitating hamstring injuries. Adjustments can be made to address tightness in joints. A chiropractor can check for muscle imbalances to get to the cause of an injury and recommend preventative measures. Muscle work and stretches can help muscle recovery and alleviate pain. Massage helps loosen scar tissue and stimulate blood flow. Petrissage, or kneading, should not be done in the acute stage. A massage technique called “stripping” rids the muscles of bumps using thumb pressure. Circular friction is effective for knots and for scars. Lymph drainage massage stimulates the immune system by increasing lymphocyte production. After a period of rest, re-engage the injured hamstring with gentle stretches. If there is a rupture at the ischium (bone at the base of each half of the pelvis), surgery may be required. Physiotherapy may help the injured area return to normal range of motion, flexibility, and strength. Once this is achieved, a patient can slowly return to a sport or activity. Optimal strength for the hamstring is at least one half the strength of the quadriceps. There should be no more than a 10% difference in hamstring strength between the two legs. There are no guarantees but stretching and doing a thorough warm-up can help avoid hamstring injuries. Hydration and a well-balanced diet (including antioxidants) are also useful, as is avoiding excessive body weight.